We believe that classical antiquities have tremendous educational and aesthetic value, even when removed from their original context and even when their original context is unknown. must take account of the interests of our colleagues in other scholarly fields, especially since our teaching mission as university museums relies on the ability and willingness of faculty and students in these fields to work with the objects we collect. To base our policies on these current AAMD guidelines creates too much risk and too much exposure for both the university museum and the parent institution. The returns of antiquities from Princeton University Art Museum and the University of Virginia Art Museum in Charlottesville have highlighted these very issues concerning both loans and acquisitions. To disregard the cultural patrimony concerns of other countries, whether or not we share them, only compounds ill will toward the United States. For university museums especially, it seems clear to me that collecting undocumented antiquities at the present time cannot be condoned. Rorschach, K. 2007. "Scylla or Charybdis: antiquities collecting by university art museums." 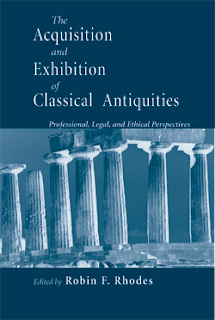 In The acquisition and exhibition of classical antiquities: professional, legal, and ethical perspectives, edited by R. F. Rhodes, pp. 65-73. Notre Dame, Ind. : University of Notre Dame Press.